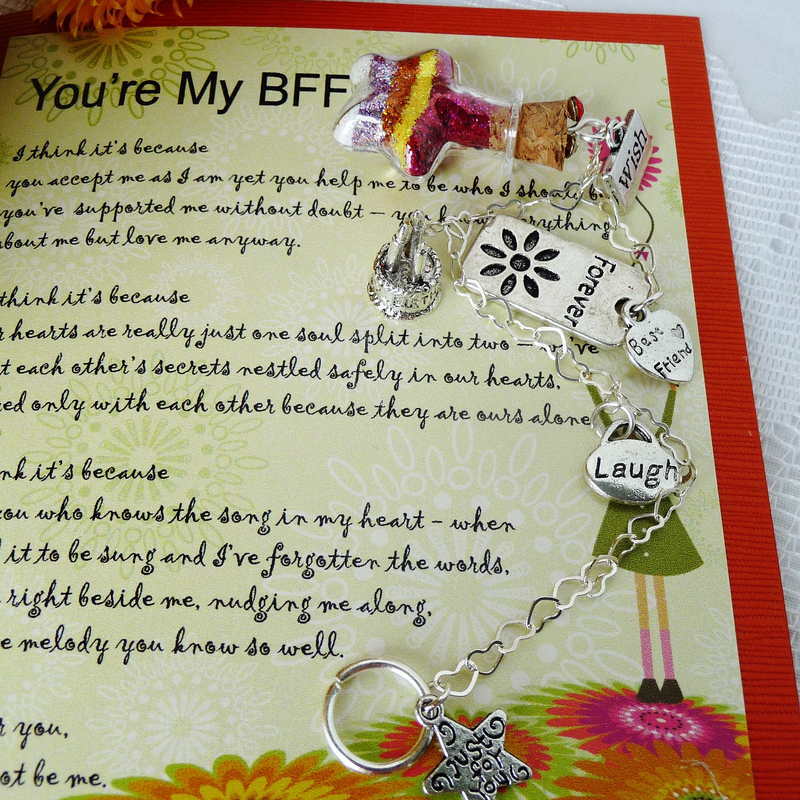 Best Friend Birthday Gifts: BFF Help from Captured Wishes! Best Friend Birthday Gifts They'll Never Forget. Your search results for ... gifts for best friend ... ends here. You know, it IS possible to know someone too well. So well that they are almost a problem ;) to buy for. What do you give that sums up the way you feel about your best friend in the whole wide world? How can you put your feelings into words and then find something to buy that they truly will appreciate, value and treasure? Look no further. We've done it for you with this precious wish vessel, a gift SO complete all you need add is your love and signature. Luckily, Captured Wishes has created a lovely, super-special gift to help you perfectly celebrate in style. It's a gift of wishes! It's so adorable and so exact. Using a combination of mediums to get your point across (a vessel filled with sparkly glitter layers that comes with a verse card and color key to explain what the different colors of fairy dust signify), your BFF will have no doubt how you feel about them! Simply provide their initial when you fill your shopping cart and this all-in-one package will arrive only needing your signature! Give them this unique keepsake gift, a physical and almost magical memento of what their friendship means to you. This gift comes with a suction cup hanger thingy (lol) as well so your BFF can hang it on a mirror, a window, a fridge, a computer screen - almost anywhere! Each Captured Wish vessel comes in beautiful, custom packaging, with a lovely verse card, which puts the thoughts and emotions you have trouble expressing into words for you. Once you've tried Captured Wishes, you'll come back time and again. Anytime there's a gift-giving occasion which is also emotional, we have the answer. The flower-shaped bottle (25mm height x 20mm wide) comes complete with a suction cup, so your friend can display it in a window or on a mirror to catch the light. This is a complete package - so personal, yet so easy. Arrives with verse card, gift box, and the wish vessel. Ready to gift! Our wishing vessels are assembled in Canada - our aim is to create the most unique product on the market today, and to that end we look far and wide for the perfect piece or component to finish each creation. We take the time to make certain that every product we create is one of a kind and unlike any other gifts you will find. Our belief it that each piece of art should have elements incorporated into it so they have a personalized feeling, rather than being mass produced. Due to the nature of these gifts, you should also expect no two items to be perfectly identical. Our suppliers are sourced from different areas of the world (England, China, Switzerland, United States, India, to name a few), so a product we offer today just may not be available the next time you visit our site... but we'll always have something exciting and new to surprise you! We also take extra care with our wishes, especially the charms that go with them - the pewter charms are given an extra protective coating of lacquer to ensure they continue to keep their sheen and magical glow for an extended life of visual pleasure. So different, so unique, our wish vessels have staying power! Wishful-filled creations that speak for your heart made with lasting beauty. That's Captured Wishes! It's worth it to take the time to keep coming back to our site...we change things up when we can, always aiming for surprise. Thanks for keeping us in mind!